Civic engagement is alive and well on Meetinghouse Hill. The latest evidence of this is the work of a resident-led project to renovate a small park in front of St. Peter’s Church, at the intersection of Adams and Bowdoin Streets. This park, originally known as Eaton Square, was renamed Coppens Square to honor Father Francis X. Coppens, a Catholic chaplain from the neighborhood who was killed in the Korean War. Eaton Square was once graced by a spectacular fountain that was a monument to Boston Mayor Theodore Lyman in tribute to his accomplishment in bringing a public water system to the city. The fountain seems to have vanished into the fog of history without a trace. 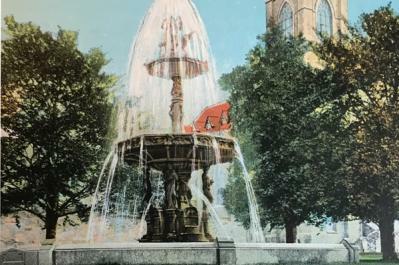 Recently uncovered minutes from a 1951 Boston Arts Commission meeting note that the top of the Lyman fountain had been damaged. It is now believed that it was removed shortly after and replaced by a comparatively diminutive fountain. The replacement ceased to function when the pipe feeding it was severed in the early 1970s during city street repairs. It has been dry ever since. Last spring, the Browne Fund and the Dorchester Arts Collaborative began talking about ways to improve Coppens Square, discussions that led to the formation of The Friends of Coppens Square (FOCS), a grassroots organization advocating for the renovation and replacement of a significant historic monument in the neighborhood. In taking on this mission, FOCS has been registered as a non-profit corporation with the state secretary of state’s office and has applied for 501.C3 status with the IRS so that private donations can be received. The group has received enthusiastic support from the city’s Parks and Recreation Department, the local and citywide city councillors, the mayor’s office, the Dorchester Historical Society, and Meetinghouse Hill resident organizations. It has hired a landscape architecture firm with a grant from the Browne Fund. As part of the process of gathering input from local residents, FOCS is hosting a meeting on Mon., Jan. 30, for residents to learn about the renovation of Coppens Square and to express their ideas and suggestions for the replacement of the historic memorial fountain. The meeting will include a history of the development of The Friends of Coppens Square group, a presentation by CBA Landscape Architects, and an open discussion. The meeting will take place from 6:30 p.m. to 8 p.m. at First Parish Dorchester’s Meetinghouse Hall, 10 Parish St. Please join us to learn more about this exciting, local, grassroots project. Edward M. Cook serves as president of The Friends of Coppens Square.